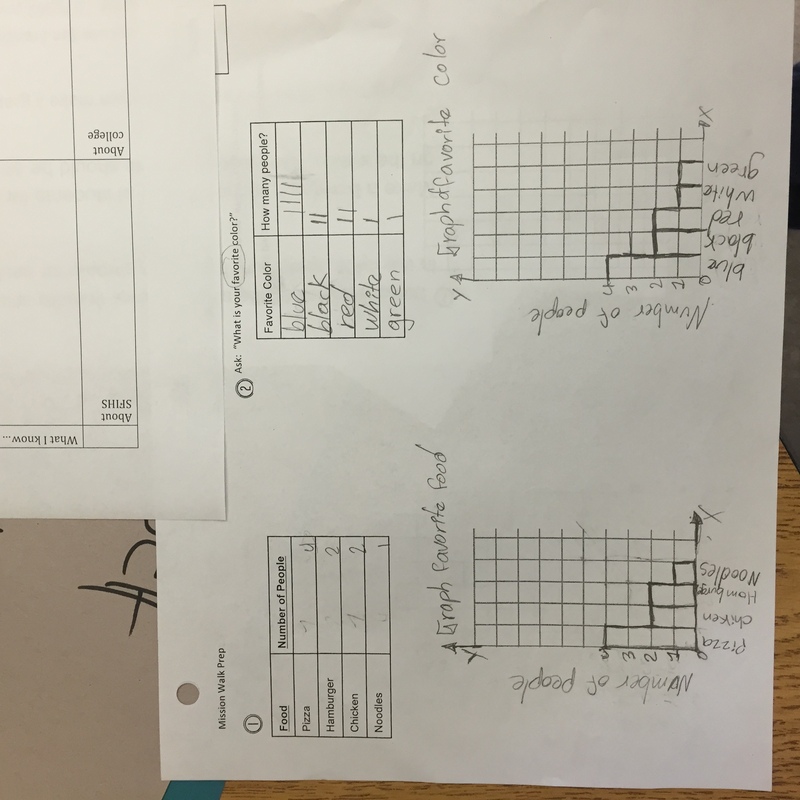 We are doing more graphing to prepare for our field trip on Thursday (the teachers are also doing more prep to prepare for our field trip on Thursday). Teaching this unit again, with many fewer students, feels so different. I feel like I’m catching a ton of things I totally overlooked and had to reteach the last time we went through this. Photo: Food and Color Graphs This photo is from a class that was much smaller today (small class to begin with plus multiple absences). So this pair worked together pretty well – one kiddo who’s been here for a year and one kiddo who is relatively new. There was also a part where students had to get up and walk around and ask each other questions. Totally not chaotic! Third year teacher moves? Or smaller class size? You decide! This unit is all about compare and contrast, which is actually much more useful than I initially imagined 2 years ago. 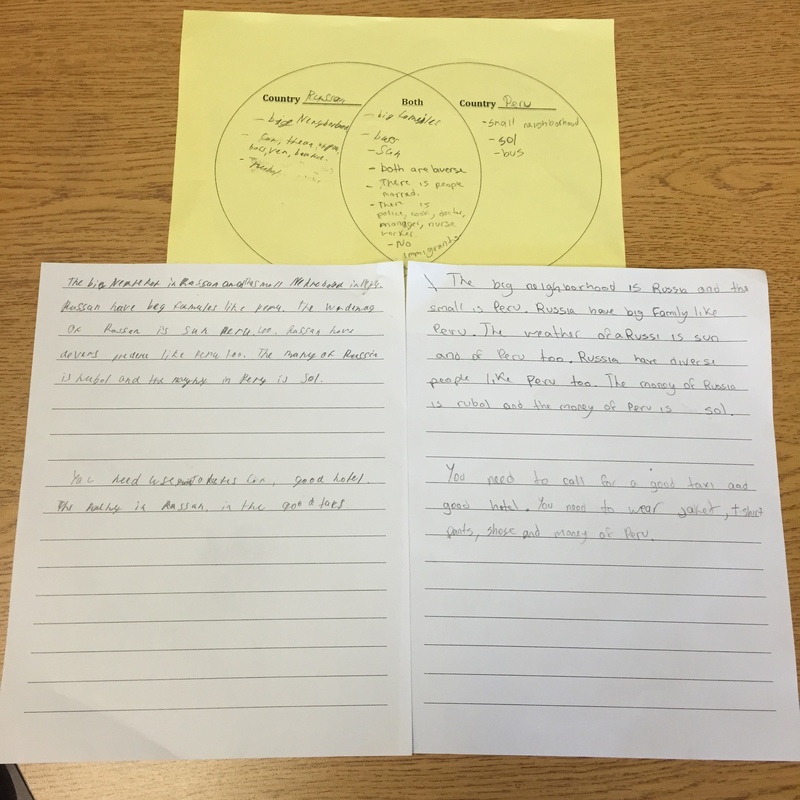 We spent today having kiddos compare their countries by making a venn diagram, then using a toolkit to write sentences. Super interesting to watch students interact with the toolkit, which is basically a list of sentence frames. Some kiddos use the same sentence frame over and over again. Some try to use all the different levels. Week One is done. To some extent, it feels much longer than a week – I’m already calling and texting home and I’m pretty sure I’ve written more referrals to our Wellness Center (for students who need extra emotional support) this week than my previous two years combined. That being said, I also made it out most days by around 6pm. Benefits of re-teaching a class, I guess. Also, we have a new student in this particular class. This student speaks Nepali and is the lone Nepali student on our team (the other team has a Nepali student. We should proooobably put them on the same team?). One of the other students (who declared in the last 5 minutes of class: “I’m not doing any work until next month” – pretty sure he meant week. I decided not to fight him on it.) wanted him to write something in Nepali. Learning Togther and Acting With Empathy (2 of our school values) in action. Today marks our first day of content. Teachers talk a lot about the first day of content and the tone it sets and the message that students take away. We reworked a lot of our first day activity (previously the marshmallow challenge) which left my room a mess the last time (just in time for me to host staff meeting, naturally). I’m pretty happy with the way it turned out – lots of reading, lots of teamwork, a fair amount of speaking English (there were probably more ways to push for this). 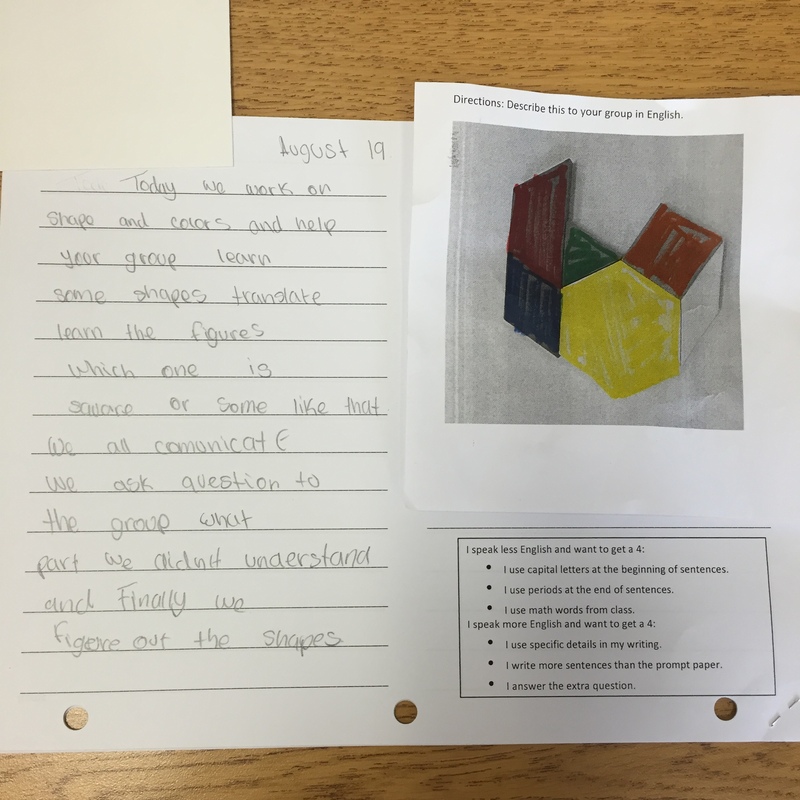 Students did a secret problem – one person got a design of shapes and had to describe it, using only English, to their team. They then had to check if their team got it right and help them to make changes. 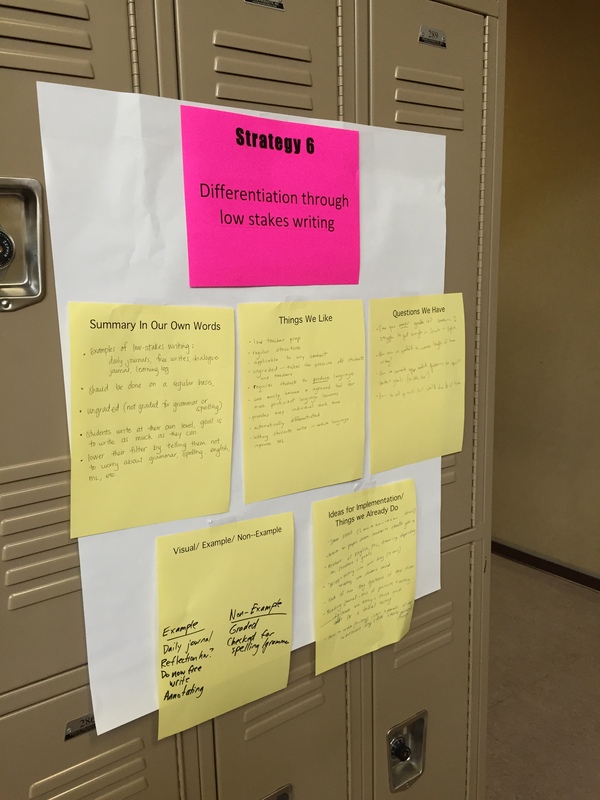 At the end of class, we asked students to write journals writing about how their group worked. We did this structure two years ago, then abandoned it when we felt that reflection homework (basically, writing about what they learned that week) took that place. It’s always interesting to watch newcomer English Language Learners try something for the first time, especially when there’s a lot of writing involved. Groups have been doing a solid job helping each other, explaining what to write, translating. It’s admittedly the honeymoon period, but I hope it lasts for a while. Right now, our classes are a bit small (our school is designed to accommodate more students as the year goes on – immigration trends don’t really follow a calendar). My classes currently range from 14 to 16 (though the class of 16 has a few students who aren’t showing for a variety of reasons). There are generally about 10 students who speak Spanish and 4-5 students who speak another language (Chinese, Tagalog, Urdu, Vietnamese, Russian). In contrast to last year (when we had significantly fewer non-Spanish speaking students), this encourages our students to speak more English and develop more of a sense of empathy for other students. We hope. Staff development week is quickly winding down. I’m fairly certain that two days ago (Wednesday) will mark the day I was actually over my head, followed by yesterday (Thursday) as the day I started breaking all my School Year’s Resolutions to leave by 6, followed by today (Friday), where I will hopefully adhere to leaving by 6 out of a sense of guilt and hope. Photo: Laminated Group Roles Curriculum partner and I are revising curriculum from 2 years ago rather than writing our own, which is much less stressful and is helping us to really think about past lessons and rework them so that they (hopefully) accomplish what we actually want them to do. First-Year-Teacher-Me also went and laminated 4 different versions of Complex Instruction group roles***. First-Year-Teacher-Me was kind of a naive dweeb. 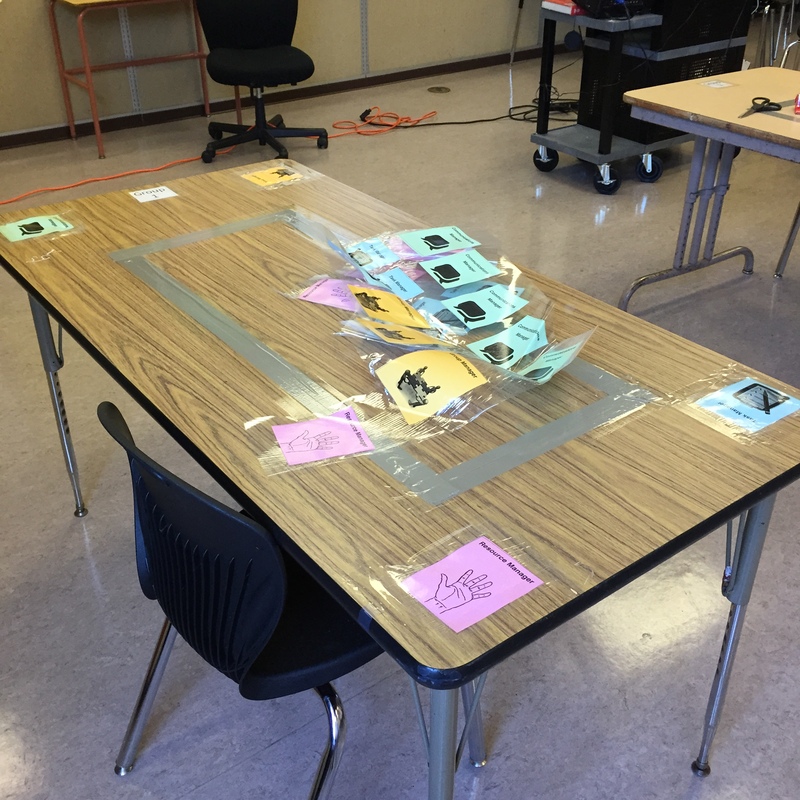 That being said, Third-Year-Teacher-Me is now taping down those laminated roles, so…good work First-Year-Teacher-Me? Going back to school means going back to routine. Going back to school means trying to get to bed on time and get a good night’s sleep (twice failed already and it’s only Tuesday). Going back to school means running to Safeway at 7am because you have no bread. 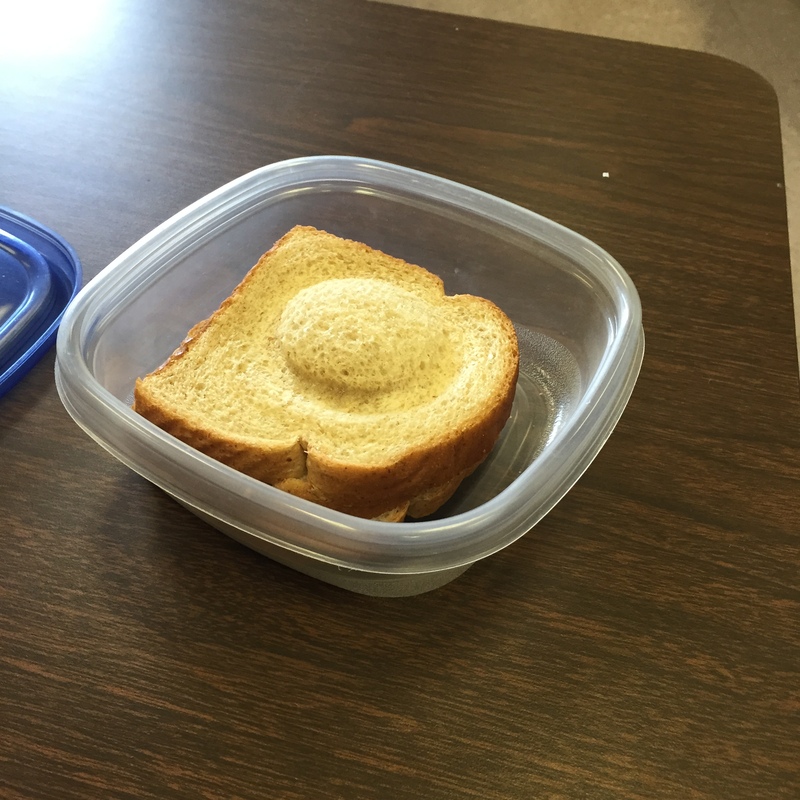 Going back to school means peanut butter sandwiches. Photo: Obligatory P,B and J We also got planning time to do some curricular alignment. 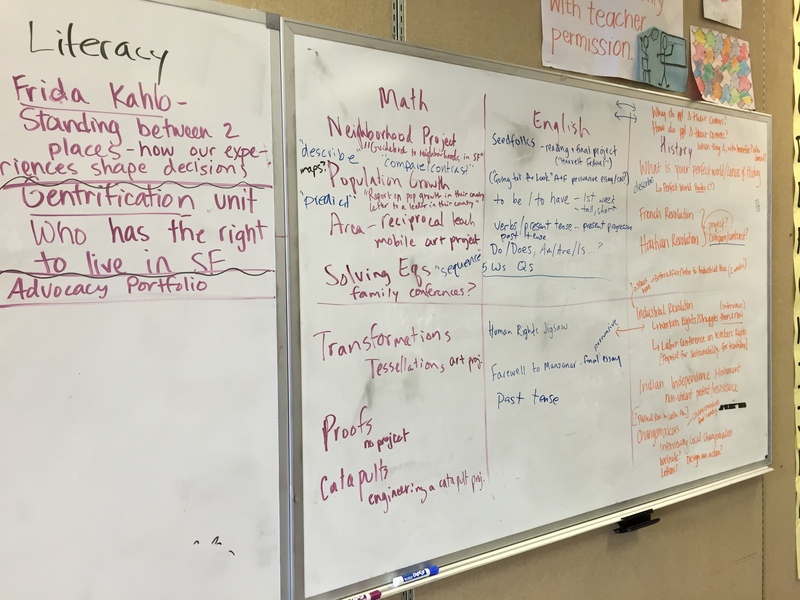 While I’ve seen versions of all of the courses this year (huzzah for teaching at an Internationals School), we’ve never had much time to explicitly make connections between courses. 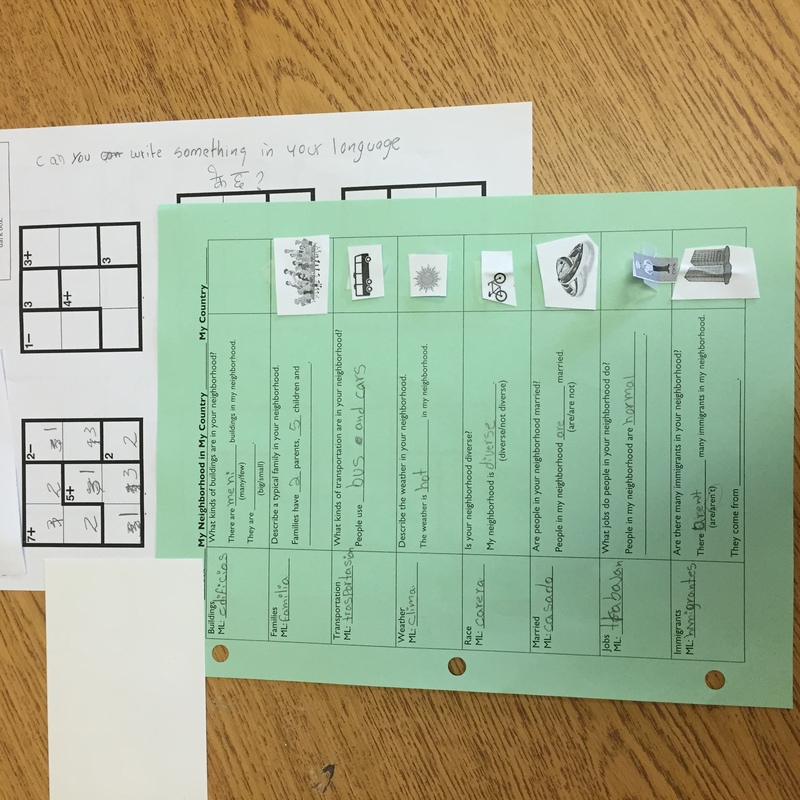 We’ve got some ideas of which language functions we can teach simultaneously to support student learning and some ideas for aligning content. Room setup continues to move slowly, admittedly due to no one’s fault but my own. There’s not a whole lot I need to do since I’m using the same room setup as last year (except the part where I moved my desk to a new location for the third year in a row). I also might be in denial that summer is actually over. 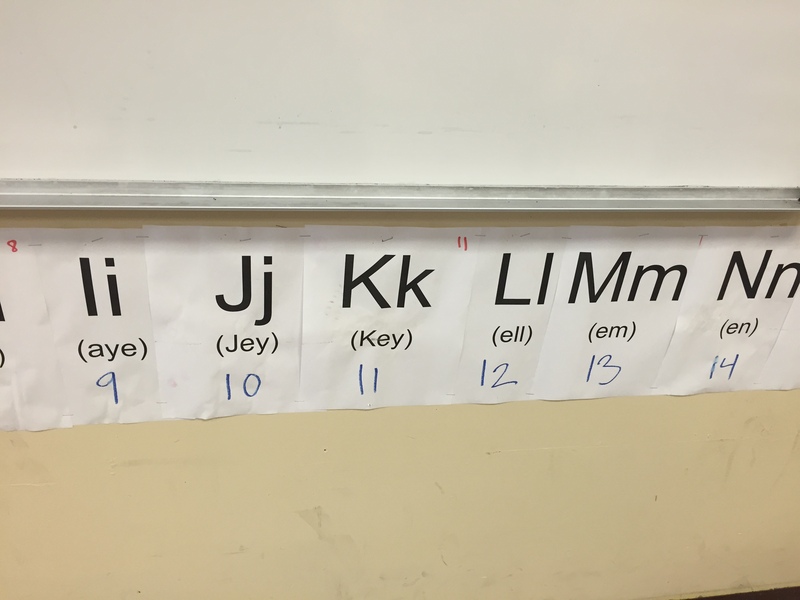 On the other hand, I’m actually going to put up the alphabet I’ve been meaning to use for over a year. First day back for teachers was yesterday. Full day of meetings, including teambuilding, icebreaking, snorting (see teambuilding), looking at cohorts of students for next year and planning for the first week. Good energy, as always. A fun (amazing) thing that our district does is power clean the floors over the summer. As a result, they move all the furniture out and then back in (after cleaning). 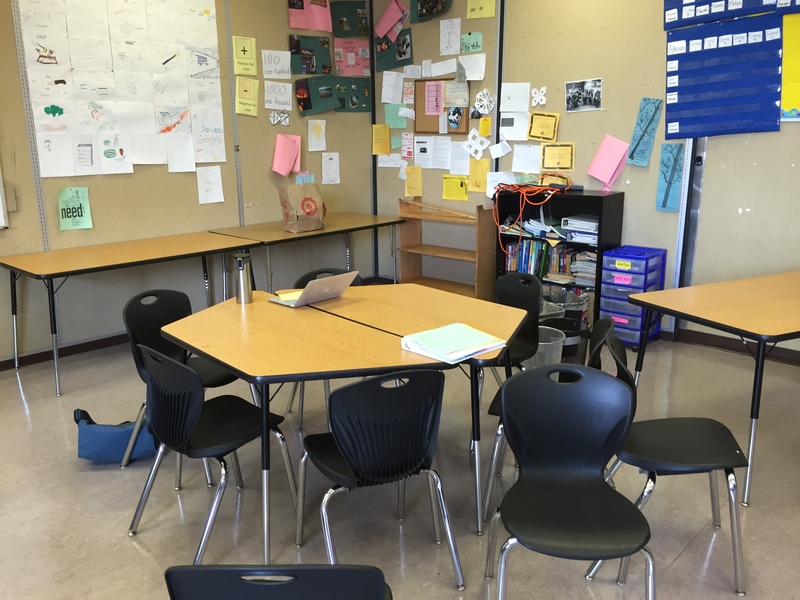 Some incredibly well-meaning person put all the trapezoidal tables in my room in pairs, just like the rest of the classrooms in our school. Except…I use the rectangular tables. Which means that I spent most of my room prep time (admittedly, only about 15 minutes) loudly dragging around tables. This is not to complain at all; more to publicly remind myself to actually put the team roles (Task Manager, Group Manager, Communications Manager, Resource Manager) on the table so that I know which student is which role and can actually use them. This feels like cheating since it’s not something that I constructed, but rather part of a full staff exercise. We spent a large chunk of time talking in small groups about ways to differentiate instruction, which is a HUGE focus at our school. We read about, talked about, and wrote about different aspects of how to differentiate instruction for heterogenous groups. Say you’ve got a classroom where the students enter at different ability levels (which is true for all schools and extremely true for our school). What do you do to reach all students?